What would you ask someone who knew absolutely everything in the whole wide world? What would a dinosaur watch on TV? Why isn’t cat food mouse flavoured? Who invented alphabet spaghetti? What’s the smelliest food? What will I be when I grow up? Join Ophelia as she meets The Man Who Knows Everything, who shares some of the best stories in the world including Aesop’s fables, Brothers Grimm and many more. Performed by two comic performers with decades of experience in music, puppetry, comedy and illusions, this is an unforgettable hour to stimulate everyone’s imagination. Both performers ensure that this is a children’s show bursting with wit, energy and a gentle self-mockery of the production’s somewhat limited special effects budget, and the occasionally necessary overacting. Larkin and Stark are a perfectly matched team, ensuring that there’s no chance of boredom setting in. Almost every line of dialogue inspires a laugh of some kind; those that don’t are usually covered with some kind of physical comedy. Almost every line brings a chuckle, giggle or squeal of hilarity from the young audience – and many adults too – as Kiki [mime artist Jack Stark] and Anna Larkin romp through zanily comic dialogue and clown-style storytelling from Aesop, Grimm and Hans Christian Andersen, with Emperor’s Clothes the most engaging. They also puzzle over the world’s biggest and smallest birds, checking Kiki’s claim as The Man Who Knows Everything. Smelly socks, hats, plastic bones, giant clothes pegs and a dead crow are but few items from a voluminous props box given wondrous effect as the intrepid pair pursue their quest for the magical bird with the golden feather. 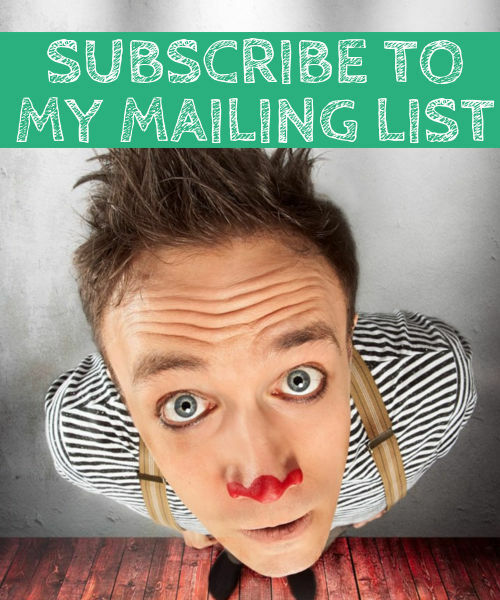 If you want an extra dollop of happiness appearing in your inbox every now and then, join my newsletter! I won't clog your inbox because I only send things when I think they are really worth reading. I really hate spam. Your email address will not be sold or shared with anyone else. Not everything is as bad as it may seem. Stop being scared about the world: watch this for 7 minutes. Where have all the Cambodian ‘funny men’ gone?